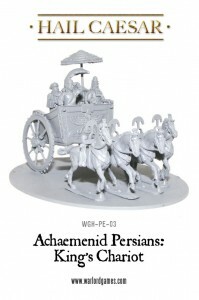 Warlord Games reminds us of what it's really like to travel in style with their Persian King's Chariot. It’s good to be King. Largely because you aren’t saddle sore or worn out from all that running around the battlefield. No, a King should be driven around and this lovely set depicts a Persian King in the comfort of his chariot.